Nero MediaHome – The heart of your multimedia world! Bring an end to time-consuming searches for your vacation photos, favorite movies, or music hits. With Nero MediaHome you can control your digital life. Whether music, photo, or video, whether on your PC or mobile device: Nero MediaHome is the universal media center for archiving, organizing, creating, and playing back your files. Give your multimedia files a home: Send photos and movies to your PC wirelessly from your iOS or Android mobile device and by USB from external hard drives or memory sticks. Import music files or rip music from audio CDs and – thanks to Gracenote ® technology – even include original album art. With items archived in clearly arranged categories such as date, faces, places, favorites or personal tags, you can now find all your media even more quickly. You can even connect directly to Windows Media ® Player and iTunes ® media libraries. Got all your media in one place? Then it’s a good time to quickly make things even better than they were before. Refine photos with automated tools and a variety of effects, create slide shows from photos and videos, and enhance them with music, movie design templates, and opening and closing credits. Create music playlists or entire albums including photos or videos. Use the streaming functions of Nero MediaHome and simply play your photos, slide shows, videos, and music to your Smart TV. Use the Nero Streaming Player App for your iOS and Android device as a remote control for your Nero media library and play everything wirelessly on your living room TV. And the best thing: You can access your entire media archive, sorted by you. Finally, it’s easy to find whatever you’re looking for! Play, music, photos, slide shows, and movie files. The improved and free Nero MediaHome WiFi Sync App ensures that you can exchange and play files wirelessly between iOS and Android devices and your media center. This means you can always access your favorite files, both at home and on the go. Those who have a large collection of images, movies, and songs know how much of a struggle it is to find a specific song or a movie or an image from a specific event. It is very difficult to organize and manage a huge collection of multimedia files, and most of us tend to give up on it easily. 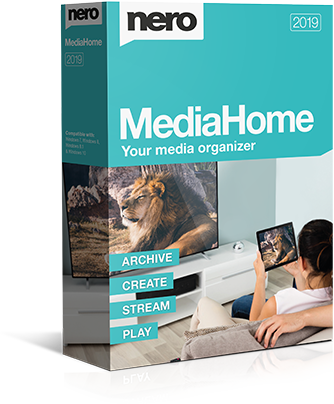 Nero MediaHome 2017 is a multimedia manager software application, designed to provide you an all-in-one solution for all your multimedia collection on your PC. With this application, you can easily archive, organize, create, and play back your files from your collection. The installation process did not go as smooth as I expected it to be. The installer is ~237MB in size and the comes with an installation wizard, that guides you through the process. The application requires Microsoft VC 2010 to be present on your PC to run, I already had it installed on my PC. When the installation wizard attempted to install it on my PC, instead of detecting that it is already installed and continuing the installation, it gave me an error and installation stopped. I had to remove the already installed Microsoft VC 2010 and reboot twice for the installation to finish successfully. Upon launching, the start-up interface shows rectangular buttons arranged under five categories, namely ‘Manage & Play’, ‘Edit & Convert’, ‘Rip & Burn’, ‘Backup & Rescue’, ‘Extras’. Each button has a small button, when clicked it displays information about that particular tool. MediaHome and Media Browser buttons work only, the other tools need to be downloaded and installed before they can be used. Launching the Nero MediaHome, you can see a user-friendly interface designed to help you browse through the files, sort them and customize their details. For photos and videos, timeline viewing mode is present which arranges the photos and videos by the date they were added. One thing that really impressed me about this tool is, it comes with a lot of tutorial videos. The videos are played within the UI from an online source, and it contains a lot of tutorials to help you get started with the application easily. The tool comes with a powerful search function, that can help you find the media files you require quickly. The applications also views thumbnails for images and videos, along with the option to edit their name and view details such as file type, size, date taken and modified, storage location and rating. Moreover, finding images with this tool is made faster by face recognition and location options. Face recognition feature let’s you select and name faces, so you can search all the photos of that person easily. Moreover, if you have misplaced pictures that you took at a certain location, you can easily find them with this application. You can also view and play all your images, music, and movies straightaway with this application, no external player is needed and it supports most of the formats. This tool also comes with a built-in photo editor, that offers a few useful tools and effects to enhance your photos. You can adjust brightness, color, crop, orientation and even apply various effect filters that are bundled with the editor. A few times, while scanning for media and generating thumbnails its performance really struggled and it froze permanently and had to be restarted. Moreover, the scanning and generating thumbnail process takes forever even with a small amount of media files. Nero MediaHome 2017 is definitely a multimedia manager application that has a lot to offer for such reasonable price. Most of the features and tools work smoothly, with a few occasional glitches. It is definitely recommended for people with huge collection of media files. Managing different types of files on your devices may not be your stronghold. Thankfully, you can find the solution in Nero MediaHome 2017. It promises to simplify the process of organizing, creating and playing back your files across devices connected to the same wireless network. Here is my experience after using this media manager. With a simple installation wizard, you will find it easy to complete the Nero MediaHome 2017’s installation process. The program’s interface is nothing complicated when you fire it up. You will have it easy navigating through the different options. Right from the get go Nero MediaHome 2017 comes across as a solution for organizing your files. In addition to its wireless control feature that it gives its users, this program quickly sorts your files on your PC. It does so by indexing the files you add by their types. At the same time, I used personal tags to achieve a detailed level or organization. Although I currently use Windows 10, I have installed the classic Windows Media Player. In turn, it was quite impressive when I noted that Nero MediaHome 2017 seamlessly connected to the Windows Media Player. This compatibility really helped me save time that I would have spent in undertaking further organization. That was not all. I noted that this version of Nere MediaHome played a wide range of file types. This was due to the program’s built-in video codecs. The compatibility goes further to make it easy play videos, audios and photos across any device connected to the same wireless network at your place. I was able to play my mobile phone content on my TV while using the phone as my remote control. Although not a blown-out editing software, Nero MediaHome 2017’s approach to present various photo editing tools like Red Eye Removal and Auto Enhance is welcome. The good thing about the whole approach is that you connect your Smart TV and preview the edited photos on a large screen for an improved viewing experience. In case you want further details to show after editing your photos, you can proceed to take advantage of the available visual effects and adjusting tools. Being a media player, I was expecting to freely playing around with Nero MediaHome 2017. Unfortunately, I lacked the flexibility that I wanted in having an option to customize hotkeys that would have made my shortcut usage experience much better. 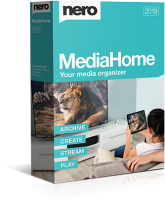 Given the different features that Nero MediaHome 2017 gives, it would be hard to skip it on your quest to improve your media management experience at home. The ability to control the PC installed version using your mobile device wirelessly is something to which you can forward. It is worth a try.